Adidas wants badly to compete with Nike in the uniform wars, they’ll have to get creative with some their color schemes. They took a positive step on Thursday, blessing the Miami Hurricanes with some fresh "305 Ice" alternates against Cincinnati. According to Miami officials, the jerseys were inspired “by the reflections and glow that come off the high-rises” dotting the Miami skyline and South Florida coast. 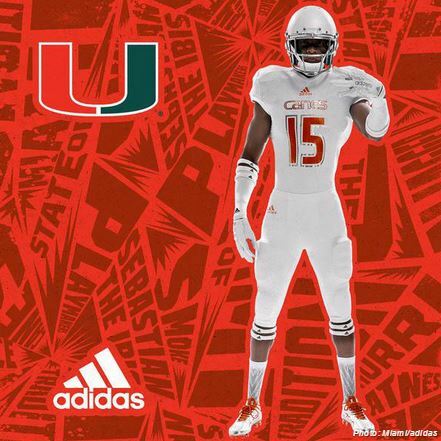 The University of Miami and adidas today unveiled the Hurricanes’ new ‘305 Ice’ Primeknit alternate football uniforms, which will be worn on Thursday, October 1st when Hurricanes take on Cincinnati on the road in front of a nationally-televised audience. The team’s new look was inspired by the reflections and glow that come off the high-rises that both create Miami’s skyline and line South Florida’s coast. Highlighting the all-white look, the new uniform is and accentuated with metallic silver and orange detailing to pay homage to both the city and the team. Developed in collaboration with the University of Miami athletic department, the special edition uniform combines style and innovation to create a bold alternate look for the Hurricanes. At the center of the design, ‘The U’ takes center stage with a metallic silver oversized ‘U’ logo on the helmet, shoulder pads and pants. Additionally, the pants feature metallic silver striping on the right leg that incorporates hurricane style cuts and patterns, while left leg features “Miami’ in oversized metallic silver text. 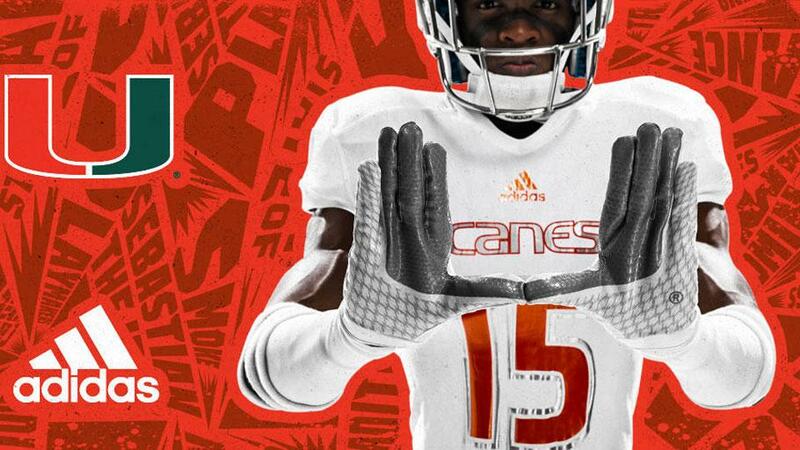 To cap off the look, the “Canes” moniker is strategically placed across the chest in metallic silver with orange outlines, and the numbers are highlighted in orange with metallic silver outlines.